First up Johnny Depp spoke about how much fun it was playing the Mad Hatter and how surprised he was he did not get fired. Fired? Depp said, "the Hatter was awfully fun, you know?" Well, considering how freaking nuts he looks in the released image, I wouldn't doubt it. Depp continued, "After doing something like a John Dillinger, it evolves where it's so overstrained because of the responsibility you have to that guy, that the Mad Hatter was like being fired out of a cannon." 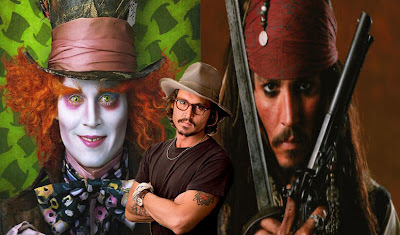 Depp finalized his comments on the Mad Hatter by saying, "The Hatter was great fun, and it's one of things where you're just amazed you weren't fired, you know?" I guess we can take those last comments to mean that Burton allowed the actor a lot of liberty with the role, let's just hope it's not similiar to the Michael Jackson impression Depp gave us in Charlie and the Chocalte Factory. Depp also spoke with Latino Review about doing a fourth Pirates of the Carribean movie. He told the news outlet, "I think for me, because I love the character so much, and I enjoy playing the character so much and people seem to like him, that if there's an opportunity to try again, it's like going up to bat." He continued, "You wanna get back out there and try and try and I enjoy playing the character of Jack very much." Some might say that the Pirates of the Carribean series only became weaker each film they made, so why try again. Depp explained his reasoning. He said, "Call me a glutton. Honestly, if we can get the screenplay right to Pirates 4, because obviously virtually no cinema is perfect." So Depp is banking that script writers will be able to do better than the last two films. He continued, "Pirates 1 had its own thing. 2 & 3 I suppose had their own thing and you know it got a little confusing here and there in the story. Not that I've seen the movies, but I hear tales [smiles]." Depp has always said he doesn't watch his own movies, but we know damn well he has said his kids love the movies, and I'm sure daddy has sat down and enjoyed them as a family.